A part of the family Fabaceae, Fenugreek is a plant that is used as a spice or as an herb; the seeds are used as spices while the leaves are used as herbs. One of its most well known uses is in curry. Although it is more commonly used as a spice, Fenugreek is also used as a method of treating various health problems in countries such as Egypt, South Asia, Italy and Greece. Fenugreek became popular largely due to the nourishment the plant offers; it has been known to contain Vitamin C, Potassium, Niacin, Diosgenin (similar to estrogen) and Protein. One of its benefits is the effects it has on women who are experiencing problems with PMS or menopause. Due to its estrogen like nutrients, Fenugreek can also increase libido and decrease the effects of hot flashes and mood swings that many women suffer from. Fenugreek is believed to have originated in the North Africa area that is closest to the Mediterranean Sea. As the knowledge of it spread, various uses were discovered depending on the region it was used in; Egyptians used the spice in embalming while the Romans and Greeks used it for cattle fodder. Fenugreek has been known in various parts of the world since the early years, dating back to as early as the fifth century. 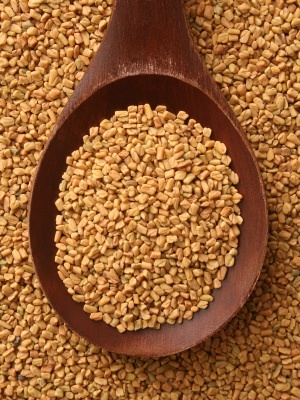 Currently, Fenugreek is most widely found in Rajasthan, India, which produces over 80% of the country’s supply. Fenugreek has been found to have many uses in addition to what it was originally used for. Those in the Arab nations cooked with Fenugreek with the belief that it would soften the throat, chest and abdomen. In addition, those living in the Middle East, India and North Africa use Fenugreek as a form of medication. The seed’s nourishing effects can be given to those suffering from anorexia to encourage weight gain. It is also used as a spice to prepare meals and can also be used for personal beauty purposes. One of the most common uses of Fenugreek is as a spice in many dishes throughout the world. In Indian nations, Fenugreek is one of the most common ingredients of curry, adding to the intensity of the flavor. While it is most commonly known for being a component of curry, it is also used in African cuisine and is included in an Ethiopian pepper blend referred to as berbere. While its bitter taste can make it a turn off at first bite, once it is included in recipes, the almost caramel leave behind adds an extra supplement that leaves diners wanting more. And in the United States, Fenugreek can be used as a maple substitute in maple syrups to offer a lower cost alternative to using pure maple. In addition, its somewhat bitter flavor prompts an individual’s body to begin to secrete bile, aiding in digestion. One of the most common uses of Fenugreek is in conditions where it can improve ones health. Fenugreek has been known to treat injuries to the skin such as burns, ulcers, boils or abscesses; it can also be used by women as a method of douching when one has excessive discharge in the vaginal area. In addition, Fenugreek can be used to stimulate contractions in order to induce labor, as well as increase milk production in lactating women after childbirth. It is believed that the oil Fenugreek contains can increase the milk production by up to 500 percent over a 24 to 72 hour time period. The Chinese also use Fenugreek as a pessary used to treat cervical cancer. In addition to the benefits Fenugreek provides women, it can also play a role in increasing one’s health. The seed can be used as a home remedy for lowering cholesterol, as well as lowering one’s risk for heart attack. Another positive effect of Fenugreek is the role it can play for those who are Type 2 Diabetic. Studies have shown that consuming an average of 500mg of Fenugreek twice daily can decrease a patient’s blood sugar levels. Another use of Fenugreek is to lower fever during an illness. When taken with lemon and honey in an herbal tea, the seeds can lower one’s temperature. 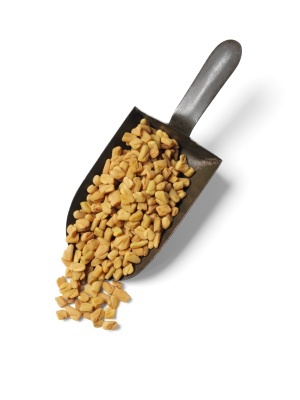 Also, Fenugreek has been found to be a natural cure for acid reflux and heartburn. If one is looking for a natural treatment for either of these conditions, they would have two options: to sprinkle a teaspoon of Fenugreek seeds on your food, or to take a teaspoon of the seeds and swallow them with a glass of juice or water before consuming a meal. This works due to the fact that the seeds contain a supply of mucilage, which coats the lining of the stomach and intestine, soothing the gastrointestinal inflammation that causes the uncomfortable conditions. While not as common as health benefits and cooking ingredients, Fenugreek can also be used to aid in one’s personal beauty regimen. In India, the seeds are mixed with yogurt and used as a hair conditioner. For those women who are unhappy with their breast size but are looking for a natural alternative instead of surgery, a dose of 3 grams of Fenugreek can be added to one’s diet to aid in balancing hormones and possible enlarging the breasts, although it has not been proven effective. The oils have also been known to be used as a lotion to increase the softness of one’s skin. The ingredients in Fenugreek assist in reducing blood sugar levels. The active components of 4-hydroxyisoleucine, sotolon and trigonelline work by simulating the secretion of insulin, thus theoretically lowering a diabetes patient’s blood levels. Fenugreek also contains coumarins, a blood thinning component, giving those who would prefer natural treatments in place of prescription blood thinners an option. It is believed that taking Fenugreek in a tea or herbal version will give you faster results, but capsule forms provide a stronger and more concentrated dose. The reason behind one’s usage of Fenugreek will determine how high the dose and frequency of its use will be. For nursing mothers looking to increase the flow of their breast milk, it is recommended to consume one capsule of Fenugreek seed of at least 500mg three times per day. However if one is using Fenugreek in order to prevent heartburn, one teaspoon before meals will suffice. Or if you are using Fenugreek to try and naturally enlarge your breast size, it is recommended to consume 3g of the herb per day. When used correctly and in moderation, Fenugreek is widely considered to be relatively safe. However there is still a chance that one could experience side effects that are common when taking any new medication, whether it is natural or prescription. One may experience nausea, diarrhea and/or gas. For those who are found to be allergic to Fenugreek, side effects could include swelling, wheezing and numbness, while those who use Fenugreek as a topical agent may experience skin rashes and irritation. Also, while not a medical issue with Fenugreek, those who use it continuously or in large doses can notice a strong odor similar to the smell of maple syrup. One should also consider the effects of taking Fenugreek while on other medications. The reactions of the medications could be delayed or impaired while using Fenugreek. It is recommended that Fenugreek should be taken at least 2 hours before or after any additional medications. With the moist and sticky texture of Fenugreek due to the mucilaginous fiber it contains, it is possible that interference with the absorption of oral medications may alter the effectiveness of one’s prescription and/or over the counter medications such as Advil or Tylenol. Currently, Fenugreek is legal in the United States and across the world and is available for purchase either in stores or online. Since it is considered a natural remedy and does not require a prescription from your doctor, Fenugreek can be purchased at a wide variety of places. Depending on the availability of locations in one’s area, Fenugreek can be purchased at GNC, Wal-Mart, Whole Foods and any health food stores. When looking for Fenugreek, it is most often found in the vitamin or herbal section. If you are looking to purchase large amounts of Fenugreek or maybe looking for a better deal than you could get in store, Fenugreek can also be purchased online and delivered right to your home. It can be found at many websites, including Amazon.com; Healthsuperstore.com; MotherNature.com and SupplementWarehouse.com, among many others. Prices range from under $2.00 to over $40.00 so regardless of your budget, there will most likely be a Fenugreek option for you. With the increase in individuals looking for an all natural solution to their health needs, the use of Fenugreek is only going to increase in popularity, which will increase the amount of studies and information available for those who are interested. While Fenugreek has been proven safe thus far, as with any change to your medication or diet, please consult your doctor and research possible side effects and drug interactions before committing to a Fenugreek heavy lifestyle. Fenugreek has saved my health. I had persistent eye problems and hearing loss and tinnitus. Desperate for a remedy, I heard that fenugreek helped tinnitus. I take three capsules every morning at eight o clock. Not only has it restored my hearing, my gaunt face has filled out, and my eyes are better. I have skipped taking it and my ears fill up again and I can’t hear, so I know it works. How much fenugreek should one take for use as a natural blood thinner? Hi, im not sure if you will see this or if you will even know the answer. I just started taking fenugreek, along witg black cohosh, and a multivitamin. In three days i have broken out on my face. There are red bumps and whitish bumps (skin toned more or less) some are like acne and other bumps not so much. I was just curious to know if this is normal with fenugreek or if it is a adverse reaction? It is a supplement capsule 610mg i have only take 1 capsule 1 time a day for the last three days. Again any insight would be greatly appreciated. Not sure if you have insight into black cohosh or if the two interact badly. Thabk you for your time and your article. Anytime you have an adverse response to any sort of medication or supplement you should talk to your doctor.